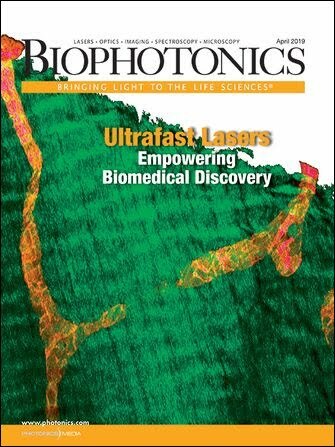 Stephan Briggs, Edmund Optics, Inc.
Optogenetics holds great promise for ailments such as migraines, blindness or neurological disorders through the interaction of opsins and light. Improvements in filters and other optical components will help in the understanding and treatment of these and other disorders. Opsins respond to broadband wavelengths, but specifically controlling which photons interact with the receptors could prolong the ability to trigger a beneficial response. To accurately control the transmitted photons, high-precision, high-tolerance optical filters are required. Courtesy of Edmund Optics. Although opsins respond to broadband wavelengths of light, specifically controlling which photons interact with the receptors will allow researchers to better understand how these specific signals can treat certain conditions. In addition to accurate triggering, controlling which wavelengths interact with these proteins may prolong the ability to trigger a beneficial response. To accurately control the transmitted photons, high-precision and high-tolerance optical filters are required. Activation of these light-driven proton pumps with broadband light could ultimately lead to saturation, or overexposure. Photobleaching, often evident in fluorescence materials, may lead to reduced levels of activation or weakened channel fluency. If this broadband white light could be filtered to a specific monochrome signal, then triggers could be directly correlated to which ion channel is triggered. For example, a cell or tissue suffering from sodium deficiency may benefit from an edge filter in place that reduces UV or IR intensity, whereas a cell overloaded from calcium excess requires a bandpass filter that only passes radiation at 649 nm. Incorporation of high-quality filters will allow researchers to have full control of this brief pulse of light. This type of work relies on fibers embedded in the brain to deliver the light, so there are two filter schemes that can be implemented. The first is a very small filter embedded to the fiber tip, and the second is a filtering system adjacent to the light source. In both situations, brief pulses of light are typically stronger and penetrate deeper into tissue, so it is critical to ensure the correct wavelength is radiated on the target. Extremely steep cut-on and cut-off bands of a filter are required, in addition to higher optical densities that will block the unwanted light from being exposed to the region of interest. Incorrect activation of an ionic channel could result in a harmful release of hormones or chemicals to a specific protein or tissue, ultimately causing more harm than good. The cut-on and cut-off bands in conjunction with a high transmission profile will ensure enough radiation to activate the correct amount of ionic activity. Optogenetics research requires markers and indicators to ensure that a trigger or signal has been activated. Fluorescence is by far one of the most effective means of achieving this. Dyes that are safe for the body, specifically the brain, are useful in quantifying a measurable reaction. Injecting a model with a fluorescent dye that binds to the channelrhodopsins and other G protein-coupled receptors will allow researchers to track the effects of light pulses and light energy. Again, optical filters will play a major role in the tracking of these fluorescent molecules. If filters are not used on the excitation source, then they will certainly be required to detect the emission signals from the membrane and ion channels. These filters could be high-optical-density neutral-density filters to attenuate the signal, or they could be extremely narrow bandpass filters to absorb the undesirable light, as any reflected light would most likely result in additional, unwanted ionic activity. Optical physiology in neuroscience: (a) The view through a cranial window used for long-term optical imaging in mice. (b) A cartoon of mouse brain from above (anterior is left) and brain areas underlying sensory-motor integration. S1 is the sensory cortex, M1 is the motor cortex. (c) A local population of cortical neurons labeled with a genetically encoded fluorescent calcium indicator used to optically record spiking activity. Courtesy of David Margolis, Lynn Ma, Henry Lütcke and Fritjof Helmchen. Many of these topics are being applied to treatments in the industry today. MIT spinoff Eos Neuroscience is working – purely on an advanced-research level – on advanced stages of blindness in mice. The mission is to apply these new innovations to light-sensitive proteins, opsins and rhodopsins to treat certain neurological diseases. The primary focus of this research is to restore vision to those affected by retinitis pigmentosa and macular degeneration, and this was successfully applied and tested on mice for the first time in 2008. The next steps are preclinical trials and then experimental clinical trials for those willing and needing drastic treatment measures. This is just one example of the real-world application of this cutting-edge technology in optogenetics. As companies such as Eos Neuroscience continue to pave the way and incorporate research from top-level universities, we will see more and more companies utilizing light to treat various diseases and ailments of the body quickly and noninvasively. This is an incredible journey not only in the field of optogenetics and human science, but also a step in the right direction for global health care and improved treatment around the world. Stephan Briggs is a biomedical engineer at Edmund Optics in Barrington, N.J.; email: sbriggs@edmundoptics.com. 1. D.U. Silverthorn (2006). Human Physiology. 4 ed. New York: Pearson Benjamin Cummings. 2. J. Spudich et al (November 2011). Lecture. 15th Annual Future of Light Symposium – Neurophotonics, Optogenetics, and Imaging. Conducted from Boston University.